Welcome to our website store . 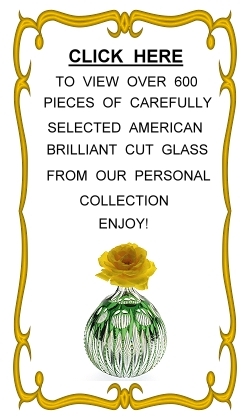 . .
dedicated to both the collecting and study of American Brilliant cut glass circa 1875 to 1915. A large number of new items are being posted and repricing of previously posted items has been done. For information on placing an order, check the drop-down menu under the About Us tab in the header. EXPLORE the website by clicking on the drop-down menu bar. To view several hundred pieces of carefully-selected American Brilliant cut glass that are indexed by inventory number, price, cutting house, shape, color-to-clear, rarities and silver-adorned items, click the For Sale Glass menu tab. LEARN more about American Brilliant cut glass by accessing several hundred pages of reference material. We are particularly pleased to be able to post selected information from Jim Havens’ E-Book, A Guide to American Cut & Engraved Glassware. The Guide has over 900 pages of carefully researched material on a wide array of subjects including major and minor cutting houses, scores of new identifications in — and corrections to — several of the previous books on ABCG (Boggess, Revi, Rarities, etc.). The Guide can by accessed from the Guide to ABCG menu tab. To find reference books and catalogs we have available, click the Identifying Glass menu tab. ENJOY several hundred photographs, detailed descriptions, the Jim Havens’ E-Book and the learning experience. CONDITION DEFINED: We have two conditions for the American Brilliant Period cut glass offered on our website — BTEF (Better Than Extremely Fine) and EF (Extremely Fine). You will find the meaning of each condition type by clicking on ‘A Discussion of Condition’ under the Articles & Opinions menu tab. If you have any questions, ask us — we will be more than happy to answer any of your questions or concerns. We are full-time stocking dealers and maintain a showroom in our home. If you are seeking specific shapes, sizes, designs or the products of a particular cutting house, please let us know — we have many items that are not yet posted. We will give priority to specific requests. We purchase and accept consignments of quality cut glass — single items or entire collections.